When we talk about women or girls, what's the comment in the first sight? Almost every people see the physical. It's still normal not only for the boys but also for the girls give the first assessment to physic although physic is not the main assessment. And every people can give judgement from style of the clothes. 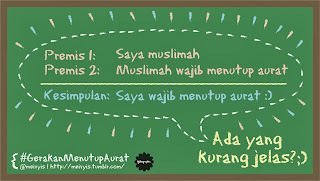 If he look the girls use hijab (kerudung) so he makes conclusion directly that girls are moslem. Subhanallah, hijabers (girls who use hijab covered) increase everyday and hijabers can use her hijab easily. The customize style of hijab are made by stylist and i have ever heard that the stylist hijab from Indonesian very creative than the other country. And almost every people feel free when used hijab with many style in Indonesia.